Since 1980 flying-foxes have become permanent city residents, due to increased planting of native trees and an increase in weeds, as their natural habitat has dwindled elsewhere (Puddicombe 1981). 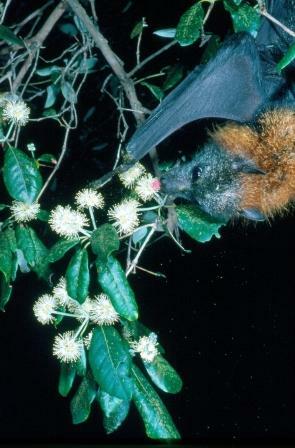 Estimates of abundance of the grey-headed flying-fox population were undertaken between 1998 and 2005. These ‘counts’ showed there are discernable shifts in the population. In most winters the animals concentrate along the coast in northern NSW and south-east Queensland. The only camps south of Wingham Brush which were occupied were in highly urbanised areas of Sydney and Melbourne where food is available from gardens and street plantings. These camps have been occupied during winter only since 1980 and their combined winter population accounted for only 10 to 12 % of the total. An exception to this general pattern occurs in some winters when spotted gums flower spectacularly on the south coast of NSW. In 2010 prolonged heavy rain and flooding in Queensland and northern NSW signalled the breaking of a long drought. Food for flying-foxes was scarce. This resulted in starving flying-foxes moving inland and south. 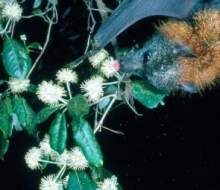 Flying-foxes were reported feeding on eucalypt blossom in inland towns such as Orange (NSW) and Bendigo (Vic). They also ate apples in orchards in Orange, Tumut (NSW) and Gippsland (Vic). One was found dead in Hobart and several were fed grapes by workers on an oil rig in Bass Strait. 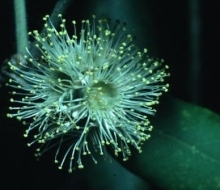 according to availablility of food – such as Turpentines which flower in Spring.